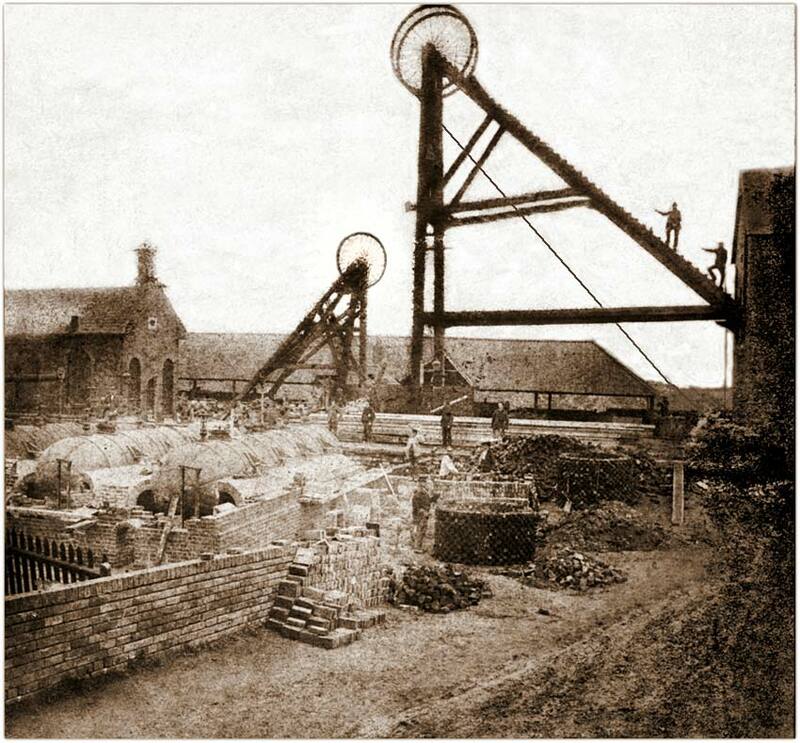 I recently bought a couple of original photographs from 1886 of what I thought was Langton Colliery, Pinxton. 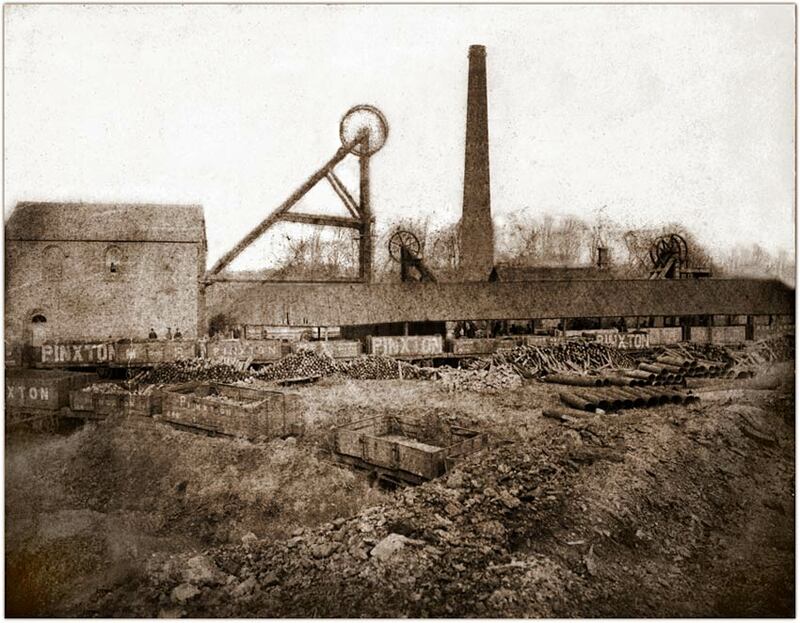 However, on further research this has been identified asPinxton Colliery, shafts 1, 2 and 6. I have recently viewed your website which is very interesting. If you wish to add the attached scans and a note to say they are from my collection, then you are welcome to add them to your site. They are very early photographs and should be available to all. I like the dedication to your friend. I had an uncle (Lou Hursthouse) killed at Glapwell Colliery top, not that many years after receiving the Queens Award for bravery for saving a man’s life at the same site. A man fell head first into a slurry pond which I understand is like quick sand and my uncle used a chain from a steam crane and risked his own life to pull him out. I have a copy of his award from the Royal Humane Society for bravery, the record of his actions from their archive and an article from the Derbyshire Times relating to his inquest. About three years later, he tripped up on the same crane line which was raised and must have knocked himself out. The crane driver did not see him and ran over him. His widow only learnt of this terrible fate when a man brought her a sum of money from the trade union for his funeral. I understand pit men paid a copper a week for this insurance. When he arrived the pit management had not even contacted my Aunt Laura to let her know. This happened whilst my uncle was undertaking overtime to help out. At inquest, the colliery was not considered at fault as it was deemed my uncle would have been aware of the line being lifted and it had been like this for some time. It went on to say that the line had been subsequently mended and that it was no longer a problem. So my aunt became a widow with no compensation or income for a husband she loved very much and made a living sewing from home on a treadle singer sewing machine until her death. My Grandad Wood started down Tibshelf bottom pit at the age of 9 years. When I was a child he once shown me a tree stump where he hid his pipe on his first day at pit. He continued to smoke and chew twist tobacco until he died at the age of 89. He was also a cricket umpire to the age of 87. I research Tibshelf history and have a lot of material and I am also a keen postcard collector with a collection of 14,000 postcards covering Derbyshire, other counties and many subjects. From time to time as I sort things out I will send you other scans of interesting information and photographs. One of my prize possessions is a book published in 1919 by the Blackwell Mining Company with superb pictures of all their collieries and details of all the miners that went to war, many that did not return and others that were affected for the rest of their lives. I'm sure I have a number of things of interest. This colliery was at the side of Pinxton Wharf, the extension of the Cromford Canal to this site being privately funded a long time ago to send coal along the canal. The colliery owner I believe also owned the famous Pinxton China factory so these products were also possibly distributed this way?